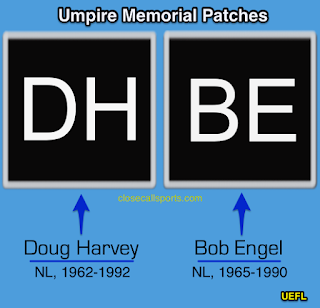 MLB umpires are honoring longtime National League umps Doug Harvey and Bob Engel, both of whom passed away over the 2017-2018 offseason, with traditional black memorial patches of DH and BE worn on the left sleeve of the umpire's uniform shirt or jacket. DH: Harvey died in January at the age of 87. He was born in South Gate, California and, following a 35-year professional umpiring career in the Pacific Coast and National Leagues, was inducted into the National Baseball Hall of Fame and California League Hall of Fame. Related Post: Hall of Fame and Former NL Umpire Doug Harvey Dies (1/14/18). BE: Engel died in Nevada in early March at the age of 84. He was a Bakersfield, California native and served as a former president of the Major League Umpires Association in the 1970s. 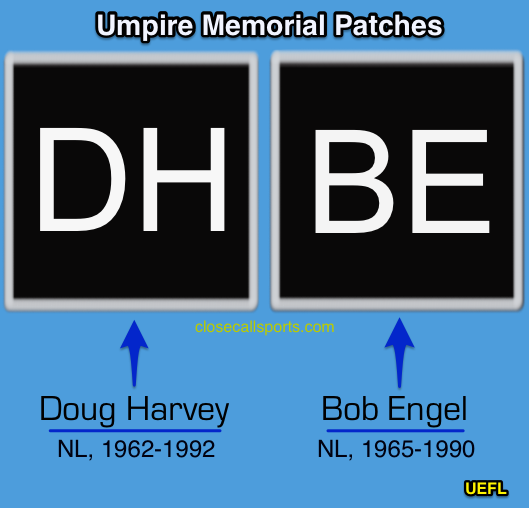 Related Post: Former NL Umpire and Union Pres Bob Engel Dies (3/10/18).